SLAVIANSK, Ukraine -- He is a man with three names, sought by Ukrainian intelligence as the top Russian operative in the separatist east. He moves through the streets in a black Mercedes, his face with pencil moustache hidden behind tinted windows, and his aim is to "destroy" Ukrainian forces that venture onto his territory. 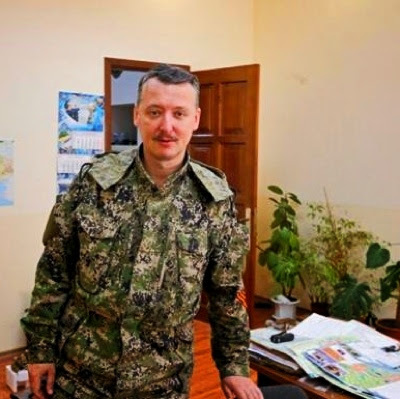 In a leaflet distributed this week in the rebel Donetsk region, "Colonel Igor Strelkov" assumed command of all rebel forces there and called for Russian army help to ward off what he calls the threat from the Kiev "junta" and from NATO. To Kiev and its Western allies, Strelkov is living proof that Moscow is behind the uprising in eastern Ukraine, despite its denials, and trying to replay the scenario that saw it seize the Crimea province in March. The separatists have said little about his identity. He is known to the fighters he commands as "Strelok" - "the Shooter". Kiev says he is actually an agent of Russia's GRU military intelligence. Residents of a Moscow suburb say he is a mild-mannered neighbor they have known for years as Igor Girkin. Whether Strelkov, Strelok or Girkin, he is now rarely glimpsed in public, driven behind tinted windows around the town of Slaviansk, which his men have turned into the heavily fortified redoubt of their insurrection. His leaflet, published on the website of separatist politician Pavel Gubarev on Monday, was issued in the name of "The Commander-in-Chief of the Donetsk People's Republic". He gave Ukrainian troops 48 hours to "pledge an oath of allegiance to the Donetsk People's Republic or leave its territory". Members of the National Guard and other Ukrainian forces would be detained or "destroyed on the spot". "Having in mind the emergency situation in the country, genocide of the Kiev junta against Donetsk's population and the threat of NATO intervention, I am asking the Russian Federation to provide military assistance to the DPR," the document said, referring to the Donetsk People's Republic by an acronym. Asked about his background, separatist spokeswoman Stella Khorosheva said Strelkov was an ethnic Russian and a veteran of the Soviet and Russian armies, but gave no other details of his origins or citizenship. "His aides do not know if he has any other names," she said. "He has rich military experience and holds the rank of colonel." He was not available to interview, she added. For a long time the only image the world had of Strelkov was a wanted-poster sketch issued by Ukraine's SBU security service. Then last month Russian newspaper Komsomolskaya Pravda issued a video of an interview with what appeared to be the same person with the same pencil moustache. In the video, Strelkov said he came from Crimea and that most of his fighters were veterans of the Russian or Ukrainian armies with battlefield experience. Their weapons were all seized from arsenals in Ukraine, he said. Moscow had "not given us a single gun, or a single bullet". The apparent acknowledgement of a Crimea link is important, because Kiev says the same Russian agents who seized that province - which Moscow annexed in March - are now behind the uprising in the east. Residents of a sleepy neighborhood in northern Moscow said they recognized their neighbor when they saw him on Russian television last month introducing himself as the leader of the militia in Slaviansk. The man they knew as Igor Girkin has lived most of his life in the nine-storey building on Shenkursk Way where his mother, two children and former wife also reside, neighbors said. Galina Ivanovna, who lives two floors below him, said she saw him last around six months ago. "He's always been very polite and very quiet, though I didn't know him well. He always wore a tie, would walk to work. Nothing about him was particularly outstanding," she said on the apartment landing. She declined to give her last name. Vladimir, 23, who lives on the second floor, said: "He is Girkin and he also has a second surname, Strelkov. My mother has known him for many years." No one answered the door at two apartments neighbors identified as belonging to his mother and ex-wife. Whoever he is, Strelkov/Girkin is an enthusiast of the hobby of dressing up in costume to re-enact historical battles, part of a paramilitary sub-culture in Russia. Bloggers on the Internet have unearthed photos of him at re-enactments, dressed in shining medieval armor and World War One-era uniforms. Yuri Pyatnitsky, head of a military re-enactment club known as the Markovtsy after a general killed in battle against the Bolsheviks in Russia's civil war, confirmed that Girkin/Strelkov was a member. He said Strelkov had some battlefield experience, although he would not say more about his background. "I respect that. What else should I say about a man who takes a strong step? He wanted to do it, and he did it. He did right." Strelkov has been based in the main rebel redoubt Slaviansk since fighting flared in the east, leading the "green men" - armed fighters in uniforms without official insignia - who have turned the town of 130,000 people into a fortified bastion. Kiev says the green men are Russian-controlled agents; Moscow says they are "self defense" volunteers, and denies any of its spies or special forces are operating on the ground. The West says Moscow's denial, as in the case of Crimea in March, is nonsense. The European Union added Strelkov to its sanctions list on April 29, describing him as a staff member of Russia's GRU military intelligence. It said he also worked as a security aid for Sergei Aksyonov, the once-obscure head of the Crimean Greco-Roman wrestling club who declared himself leader of Crimea when armed men seized its regional headquarters in late February. Aksyonov is now the official leader of Crimea as a Russian region. But even on the EU's sanctions list, the full identity of Strelkov remains mysterious: when Brussels published the list with his name, it left his place and date of birth blank. To Kiev, Strelkov's tactics show that Moscow aims to repeat the Crimea operation: armed men seize government buildings, proclaim themselves in charge, declare independence and proclaim their own militia to be the official security forces. Ukraine's security service has released numerous recordings of what it says is Strelkov taking orders and advice from handlers in Moscow. Those recordings cannot be verified. Kiev blames him in particular for the death of a local pro-Ukrainian councilman in the town of Horlivka, whose body was found after he was led away from the town hall by rebels. Interior Minister Arsen Avakov described Strelkov as "a monster and a killer", wanted on charges including premeditated murder, sabotage and involvement in the seizure and week-long detention of foreign military observers two weeks ago. "Fate has decided that Girkin has become a target of our Anti-Terrorist Operation," he said. But for many in the Donetsk region, Strelkov's fledgling army is what stands between them and what they see as Ukrainian nationalists sent to subjugate a Russian-speaking population. Slaviansk itself has been sealed off to Ukrainian forces for more than a month and controlled by rebels. "The man is a hero whether he is a colonel or a corporal, he is leading our boys to victory," said Fyodor Dyalnoy, a 63-year-old pensioner. "So what if he came from Russia? If Russia could only send us more people like him." "How can he be an agent on his own soil? It is clear this is Russia, as it should be." "I believe he is a good officer, he put some order in these troops and made an army out of them." Still, not everyone is happy to have the green men around, or their mysterious leader. Irina, 39, who declined to give her surname, said she wanted "them and all these armed people and this war out of this town." She added: "I don't care if he is a Russian or a Martian or whatever he is."